A Guide Book for the Way of the Roses Cycle Route is now available from Sustrans, the national charity responsible for the national cycle network. Written by Rupert Douglas, the Guide Book provides an ideal Xmas present and may be purchased from Sustrans on-line shop and used in conjunction with the official map. 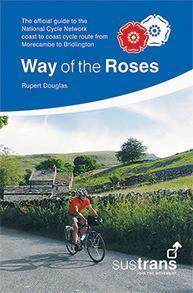 To buy either the Guide Book or the latest Way of the Roses map, please visit the Sustrans Shop.